it’s great, when a restaurant really does it well, it’ll put the place on the map. So many people love it, and so many people are disappointed when it’s done wrong (no flavor, poorly seared, too much fat or butter, burned, etc). That being said, I’d like to say a few things about the production itself. Corned beef hash is two things: corned beef and potatoes. Restaurants that do breakfast don’t bring in a lot of money per check, so they look for fantastic, and often creative ways to turn left overs into profit. They may include left over bacon, hash brown potatoes or home fries, onion bits, pepper scraps… all the little bits of left overs that when combined, can work very nicely into a hash. I’ve worked in many restaurants and hotels that serve breakfast, and each place makes its hash a different way. 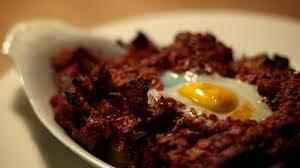 In my opinion, the best hash started with cooked and ground corned beef, and excellent quality pre-seared hash browns. And that is exactly how I make mine! And regarding the cooking process itself, it’s back to the basics! Cook everything separate, adding as much flavor as possible, and combine everything together at the end, resulting in a deeply flavored, balanced and delicious product. It may be a little more complex and time consuming than other recipes, but the result is outstanding and absolutely worth it. Fill a medium sized stock pot with cold water. Open the corned beef and place in the water, along with any spices that may have come with the beef. Place the half onion, carrots, celery and potatoes in the pot. Bring to a simmer and simmer until the corned beef is extremely tender. Remove the potatoes and let dry on a kitchen rag (this absorbs any excess water, which enhances the potato’s flavor and helps develop the starches). Remove the corned beef and let cool. Cut as much fat from the corned beef and cut the corned beef into small dice. You can also pulse the corned beef in food processor to achieve the desired size and texture. In restaurants, we sometimes run the cooked corned beef through a meat grinder. Peel the potatoes. Using a vegetable grater, grate the potatoes. Mix the grated potatoes with the cheese and scallions. Add a pinch of salt and pepper. Form the mix into a large patty. Heat the vegetable oil in a non-stick or heavy cast iron skillet and sear the potato patty on both sides. Remove the patty from the pan and let cool slightly. In a heavy iron skillet, begin heating half the butter. Add the corned beef, diced onion and peppers. Sear until slightly browned and very aromatic. Break up the potato patty into small pieces and add the potatoes to the skillet. Add the rest of the butter. As the hash browns, continue to stir. Season lightly with salt and pepper. When nicely seared and blended, remove from the skillet and serve right away. Best served with eggs poached over easy.